UPDATED: Fri., Sept. 7, 2018, 4:05 p.m.
Where: 402 W. Main St.
Auntie’s Bookstore will celebrate its 40th anniversary Saturday, marking a longevity that’s rare among small retailers, and particularly notable for an independent book seller. In the age of Amazon deliveries and Kindle readers, dedicated staff and devoted customers keep the doors open at one of Spokane’s brick-and-mortar icons. “When you’re in Portland, you go to Powell’s Books. When you’re in Seattle, you go to Elliott Bay. When you’re in Spokane, you go to Auntie’s,” owner John Waite said. Waite bought Auntie’s Bookstore about 2 1/2 years ago from original owner Chris O’Harra, who was retiring. Keeping Auntie’s operating was the primary concern for Waite, a longtime patron, friend and former business associate of O’Harra’s. Auntie’s began as the Book and Game Co. in the Flour Mill in 1978 – a venture between O’Harra and her brother-in-law, Shannon Ahern. The name changed to Auntie’s in 1994 when the bookstore expanded and moved into its present home in the Liberty Building. Ahern later left the business, though he and O’Harra remain partners in the ownership of the 1908 building. Waite, 53, was an early Book and Game customer, frequenting the store as a teenager. He later managed Merlyn’s Comics – a science-fiction spinoff – for O’Harra and Ahern, and eventually bought Merlyn’s, which he continues to run. Auntie’s features more than 40,000 books in 12,000 square feet of space. A staff of 22 full- and part-time employees help customers select their next book, whether it’s a mystery, classic, sci-fi, nonfiction or children’s book or graphic novel. Converting visitors into regular customers is critical to the store’s success. Auntie’s markets itself as a destination. A half-dozen book clubs meet there. Most weeks, the store hosts two to four author readings or literary events. Other Liberty Building tenants, including a restaurant, winery, other retailers and professional offices, generate foot traffic that helps sales. Avid readers not only want to read books, they want to discuss them, said Kerry Halls, the store manager. Auntie’s offers people that chance, she said. “You can’t go to Amazon and talk to someone about your favorite graphic novel, or discuss how the latest Stephen King (release) compared to ‘Pet Semetery,’ ” she said. And when you’re shopping online, you can’t ask a clerk to help you find a book with a pink cover you saw three months ago at Barnes and Noble, said Halls, who recently fielded that customer inquiry. To compete with the convenience of shopping online, Auntie’s tries to anticipate what books will trend so they are in stock when customers want them. But Waite doesn’t sugarcoat the realities of selling books in the era of Amazon and other online retailers. “Even the big guys can’t make it,” he said, noting brick-and-mortar retailers are struggling nationally, and Barnes and Noble constantly reorganizes in a quest to halt declining sales. Among independent booksellers, Brian Juenemann sees signs for optimism. 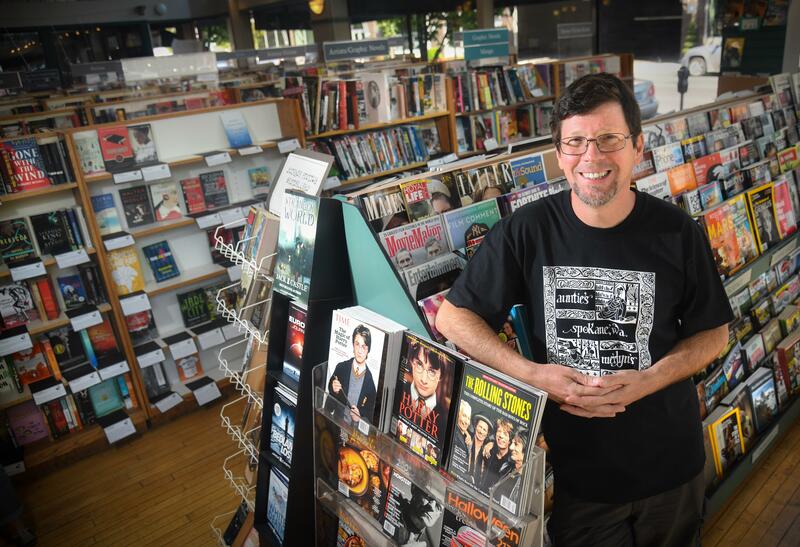 He’s the executive director of Pacific Northwest Booksellers Association, which represents about 130 independent stores in five states. When he was visiting member bookstores this summer, Juenemann was encouraged to see more children and teens. Waite attributes part of Auntie’s longevity to Northwest culture, which he said encourages new ways of thinking and the diversity of ideas, and also to Spokane. Waite will be on hand Saturday to greet shoppers at Auntie’s anniversary celebration. He hopes to see many longtime, or “classic,” customers, and he hopes that many new chapters await the store. Published: Sept. 6, 2018, 5:52 p.m. Updated: Sept. 7, 2018, 4:05 p.m.